When the NTSB investigation of the March 16 collapse is complete, it will be posted here. I found interesting that this is functionally, it was more of a truss bridge than a cable stayed bridge, and that truss bridges constructed of concrete are very rare. Also, the statement, “The bridge was meant to last more than 100 years, and to withstand a Category 5 hurricane, in a statement by the university.” will undoubtedly be re-examined by experts. Scientific American: How Do Forensic Engineers Investigate Bridge Collapses, Like the One in Miami? The engineering discussion is limited. NTSB investigators have much more vital information including the “as built” schematics and notes on design changes. There are parts 1 to 4 – search the site for more details. The failed span lacked redundancy with just a single set of supporting beams. Truss bridges normally have two sets, one on either side. The unusual design of the criss-crossing beams going down the center, gave pedestrians unobstructed views, but added to the vulnerability of the bridge to failure. 3/22/2018: Who had ultimate control of the project? Florida Department of Transportation had “oversight responsibility” but considers this to be a FIU project. Note: it is common for lawyers to seek out victims of accidents, and file initial documents for legal action before the accident has been properly investigated. These filing are very preliminary. FIU held a vigil in memory of the victims of the bridge collapse on March 21, 2018. After the vigil, students marched to the intersection of 107 Avenue and 8th Street, within site of the accident. (Various media reports). Six motorists died in this tragic accident. This page may be more of interest for individuals trying to understand how the accident happened rather than other aspects of the accident. I’ll add to it from time to time. In general, the diagrams can be clicked on to enlarge in a separate window. The video shows the accident began near the north pylon, which was followed by collapse of the entire span. It occurred almost exactly where the crane is shown positioned above the canopy. I have added some blue lines, to make it clearer. This frame is at the 8 second mark. The entire collapse occurred in about 2 seconds. The video was taken from a car going in the east direction, so the collapse is at the north end of the span. 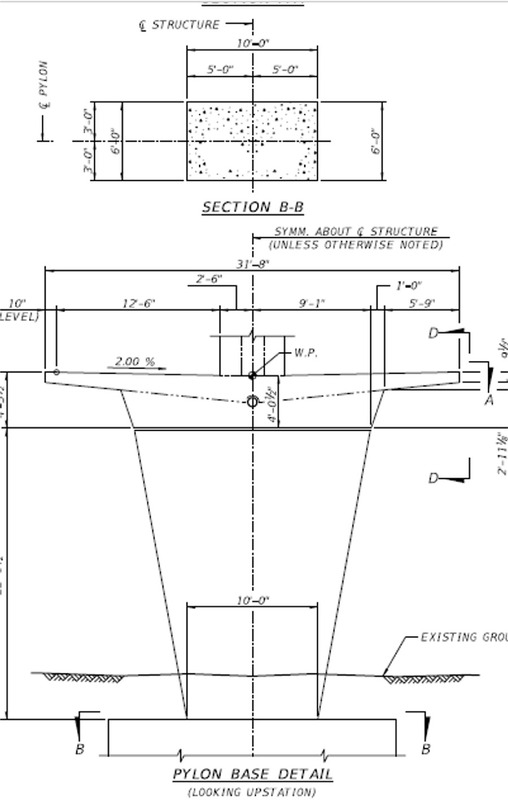 The link below, provides the engineering drawings from the original proposal, dated September 30, 2015, from pages 103 to 115. The north pylon, which I called the tower post is shown below. The top of the pylon is 20 x 21 ft. At the base, the pylon is 10 x 6 ft. Below surface, the foundation is 5-ft thick. However,. there may have been design changes, as the top of the pylon looks more rectangular than square. I think this is the top of the north pylon. He also makes an excellent point, as accidents of this type (failure during installation) are very rare, because it is easy to over design (make a bridge stronger than required) to overcome imperfections and/or slight errors in design. The frame from the car cam shows the accident began at support members 10 and 11. 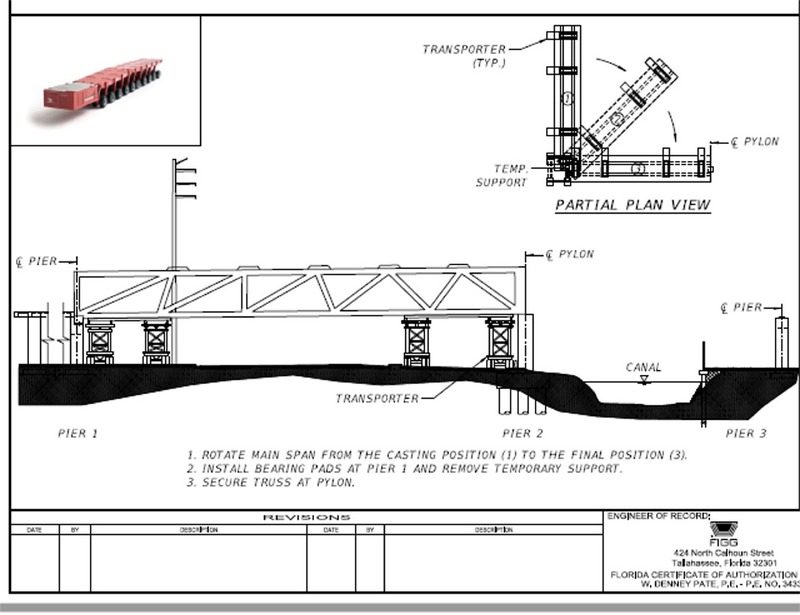 This drawing is the perspective of the bridge going in the west direction, with the south end to the left. The installation does not appear to have followed plan, as the transporter was moved further away from the north pylon. So, it seems more that the accident began in the north end of the span. CBS news states the bridge was already behind schedule and over budget, due to design changes. The north pylon was moved 11-ft to the north, moving it very close to the canal (see link below).